Below is a figure of the Euro monetary base. I find it puzzling for two reasons. First, it shows an upward trend that starts in 2002 and continues to the present. The monetary base has more than doubled since this trend begins. What explains it? It almost looks like a long, drawn out quantitative easing program. The second thing to note is even the financial and Eurozone crisis is not enough to deter the ECB permanently from this trend. The commitment to the trend seems to be driving the sharp fall in the monetary base from June 2010 to the present. So what is going on here? That picture is really strange. That is exactly what I would expect if they were targeting the monetary base, rather than inflation. It stays almost perfectly on trend, until the financial crisis. And then it blips up a couple of times, but keeps returning to the same trend line. 2. It would balloon during the crisis. 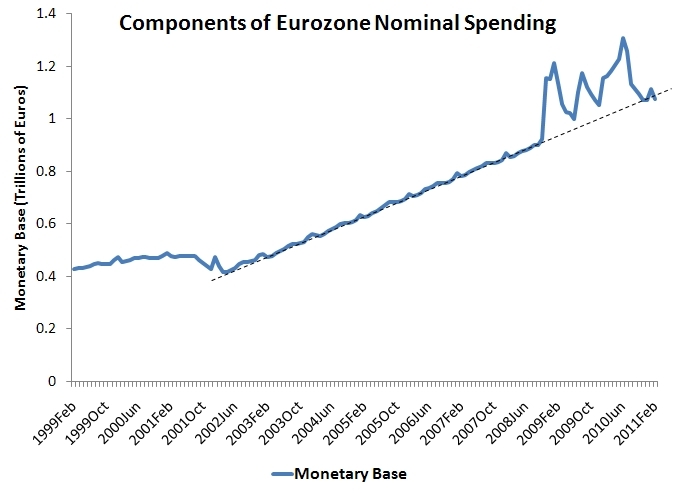 Title: "Is the ECB really targeting the monetary base?" Then sit back and watch the hits pour in! Hey, it worked for me on "US productivity exceptionalism"! Congratulations to David Beckworth for unearthing the chart above. My explanation (largely surmise) is thus. As from around 2002, the “tail is wagging the dog” as Steve Keen put it. That is, commercial banks bid for ever increasing amounts of money from the ECB, based on apparently good collateral: rising property prices. But dogs don’t like to admit they are being wagged by their own tails. So, at least in the case of the ECB, they organise a “straight line” increase in the monetary base (a la Milton Friedman). The annual increase is far too big and is more than Friedman would have recommended. But the dog temporarily manages to give the impression it is in charge – until the inevitable bust. 1. Milton Friedman wanted to target M2, not M0. 2. That thing is just too damned straight. There are no straight lines in economics, unless somebody decided to make them straight. Thanks for the graph David. Brilliant idea. I will do it, as I actually have several other figures on the Eurozone I have been meaning to post and discuss. The "targeting the monetary base" bit will be a nice lead in to the broader discussion. Interestingly, what these figures collectively show is that it is the monetary base driving most of the growth in nominal spending. The money multiplier is flat and velocity has a steady decline. Either the ECB data is really messed up or monetary conditions are really odd in the Eurozone. 2. Reference value for money supply growth (4.5% annual growth rate). Not sure what money supply measurement is used here, I'm just looking at my notes. Might that help explain your graph? I thought a central bank could target the base or the overnight rate, but not both. A graph of the ECB policy rate from '02-'07 shows that, like the Fed, it left rates unchanged for an "extended period", and later raised them a fixed amount at each meeting. This doesn't look like a series of rate movements intended to produce a consistent rate of growth in the base. One possible explanation for your graph is that European bank demand for reserves was insensitive to changes in the ECB policy rate from 2002-2007. Since the E. banks were "shadow banks", could this have reflected their strategy of consistent balance sheet growth through securities purchases? JDTapp: Yep. But IIRC, the second pillar was M3? Not the base. David: It might be interesting to contrast with a same graph for the US. Has the Fed Done Too Little or Too Much? 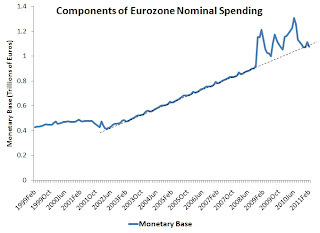 Why the Ongoing Weakness in Nominal Spending? They Did It, They Did, They Did It!